One of a series of three advertisements for York Wallpaper & Fabrics. 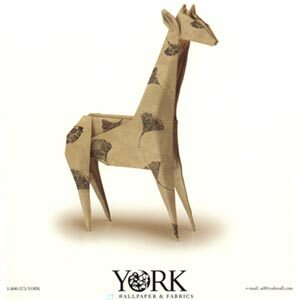 This model was based on a model of a baby giraffe that I developed in 1993. The art director preferred an adult animal, so proportions were adjusted until I arrived at the model you see here. Unfortunately, the wallpaper was a little too springy to fold well, so the final model was folded from white parchment paper, and the wallpaper texture was added by computer.